Villas to sleep 40 to 50 people with pool. Extra large villas for extra large groups of family and friends! Why are our large group holidays for family reunions and special birthday celebrations such fun? One of our customers tells her story. N.B. The ” sleeps” figure includes any sofa-beds. If you don’t want to use sofa-beds please check the number of bedrooms and ensure that they will accommodate your party. Montelopio, near Peccioli, Tuscany. Sleeps 42 in 14 bedrooms, 10 bathrooms. A shared room with satellite TV is available, suitable for dining in. Swimming pool. Colonica Al Trasimeno, in the small village of Vernazzano Basso, Umbria. Sleeps 44 in 15 bedrooms, 11 bathrooms. On-site restaurant. Guests can book dinners, cookery classes, wine tasting etc. The owners produce red and white wine. Swimming pool and baby pool. Table tennis. Stone-built barbecue. Children’s playground. Wifi internet. Lake Trasimeno with sandy beaches and watersports at 5km. La Valle. 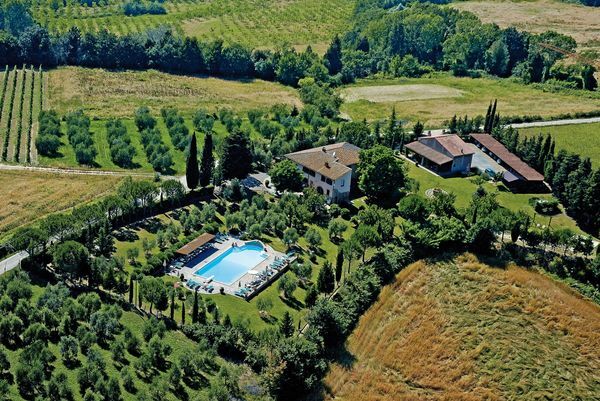 Just 1 km from the small town of Montaione with all kinds of shops etc. Shopping centre at 300m with supermarket open on Sundays. 45km from Florence. Sleeps 46 in 16 bedrooms, 12 bathrooms. Swimming pool and children’s pool. Shared tennis court. Wifi internet. Tizzauli. Near Montespertoli, Tuscany. 30km Florence. 35 km San Gimignano. Sleeps 47 in 19 bedrooms, 16 bathrooms. Swimming pool. Table tennis, table football and 6 bicycles to explore the surrounding countryside (free of charge). Large garden. 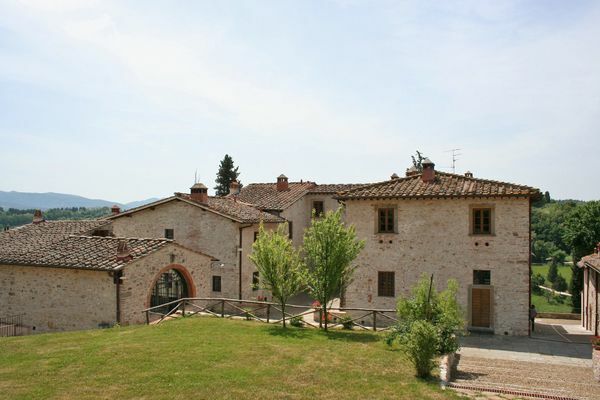 Perfect base for exploring the Chianti area. Le Fonti, near Grassina (just 1 km), Tuscany. Convenient location for weddings etc. Only 10 km from the centre of Florence. Sleeps 50 in 25 bedrooms, 25 bathrooms. Swimming pool with jacuzzi area. Need an even larger property? We have a selection of multiple-unit properties – e.g. farmhouse complexes divided into apartments with pool and good on-site facilities – that would be suitable for very large groups of 50 – 100+. Please ask us here for more information, giving us details of your party size and requirements.